MTN is at it again, they have just introduced new double data offers on all data purchase valid for 3months. Subscribers will enjoy 100% Double Data Bonus for complete 3months. 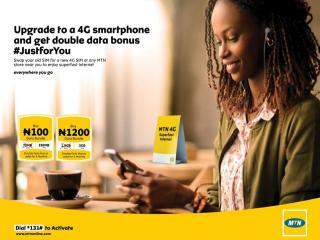 This offer is only eligibility to 4G users only, MTN has taken to their social media page announcing this offer. This isn't like the Independence 200% data bonus that the offer last for just a day or last the super Sunday 200% bonus that the offer last for just a day. This 100% double data bonus offer is valid for 3months. All 4GLTE users will enjoy 100% Double Data Bonus for complete 3months on the network. Monthly N1200 plan now gives 3GB instead of 1.5GB. This applicable to all data plans on the MTN Network for all 4GLTE Customers in Nigeria to enjoy. What are you waiting for? Kindly upgrade to a 4G network and enjoy these offer. After upgrading your SIM to a 4G enabled one, kindly dial *131*1# and choose a data plan and it will be doubled.